Los Angeles Whistleblower Lawyers: Reporting an employer’s illegal actions takes courage, as whistleblowers often place their reputations and careers on the line in order to stand up for what’s right. In some situations, whistleblowers may even be subjected to financial and emotional distress, particularly if an employer chooses to retaliate against them. At the Azadian Law Group, PC, our Los Angeles employment lawyers are proud to represent whistleblowers and help them fight for justice. Skilled at going up against employers in various legal settings, our attorneys are ready to help you protect your rights and maximize your recovery when you are ready to move forward with a whistleblower or qui tam case. Committed any type of fraud – These whistleblower cases are known as qui tam cases (and are discussed in more detail below). Any employer policy that deters them from becoming a whistleblower. Any other form of fraud involving government funds, including monies owed to the government and/or funds paid out by the government. According to the False Claims Act,2 when qui tam claims are successful, they can result in compensation for whistleblowers that is as much as 30 percent of the recovered funds (i.e., the monies recovered by the government from the case). 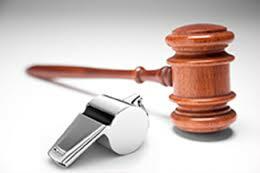 To find out more about your potential whistleblower or qui tam claim, contact a Los Angeles employment law attorney at the Azadian Law Group, PC for a free case evaluation. Our lawyers are ready to fight for you. Call us at (626) 449-4944 or send us an email via this contact form to find out more about your rights and case, as well as how we can help you. If you choose to move forward with us, you will not have to pay us any legal fees until or unless compensation is secured for your case.